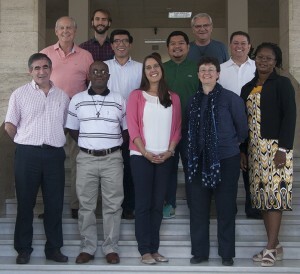 The International Council for Association and Lasallian Educational Mission (CIAMEL) gathered in September for its third meeting at the Generalate in Rome. Formed in 2015, the commission is tasked with animating and directing existing and future educational programs that embody the Lasallian mission. In the recent three-day meeting, CIAMEL members discussed various topics and propositions from the 45th General Chapter regarding the creation of a Declaration of Lasallian Pedagogy, collaboration with the Formation Secretariat on the Guide for Formation, criteria for a ministry in the Lasallian network, the 2020 International Assembly, various publications, mission council structures across the Institute and the preparation of the ad-hoc commission on pastoral ministry. Representing the Lasallian Region of North America (RELAN), Alisa Macksey, CIAMEL chair, said the work being done in Lasallian ministries throughout the world inspired the committee. In addition to Macksey, other members from RELAN include Brother William Mann, FSC, representing the International Association of Lasallian Universities (not present at meeting) and Antoine Béland, the Institute Coordinator of Young Lasallians. General Councilors Brother Gustavo Ramirez, FSC, and Brother Rafa Matas, FSC, accompanied CIAMEL in the discussions.